The winning Coastal Defense app was developed by The Nature Conservancy. Winners of the Esri Global Disaster Resilience App Challenge were recognized at the United Nations (UN) Climate Summit in New York last September, honored for devising life-saving apps that will be used to reduce the impact of extreme weather events on cities and coastal communities. The apps entered in the challenge supported the Making Cities Resilient campaign by the UN Office for Disaster Risk Reduction (UNISDR). Esri awarded a prize of $10,000 each to the winners for the best professional/scientific app and the best citizen/public-facing app. Both will be made available for use to the 2,200 cities, towns, and municipalities involved in Making Cities Resilient. The winner in the Professional/Scientific category was The Nature Conservancy for the Coastal Defense app. It quantifies how natural habitats can help protect coastal areas by decreasing wave-induced erosion and inundation. 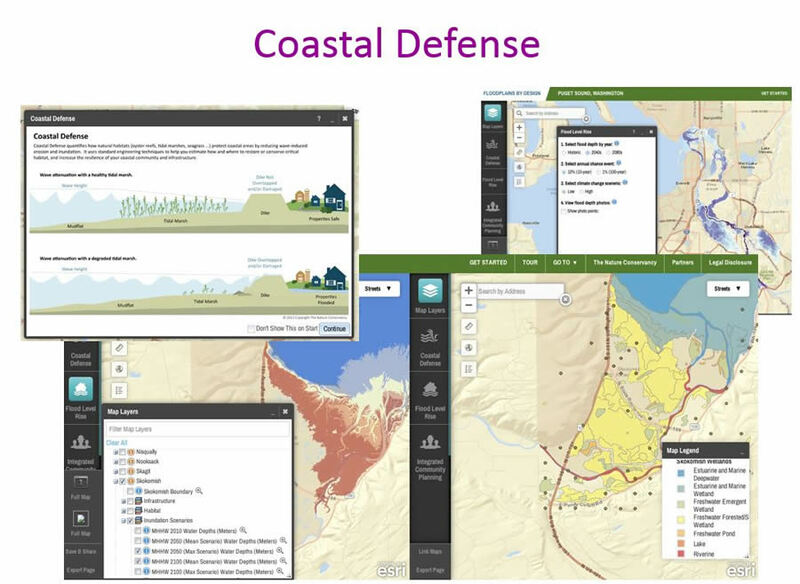 Users can see where their shorelines have the greatest risk of erosion, understand how coastal habitats diminish wave height and energy, and decide on the best course of action. Leon Storey and Gareck Packer developed Guardian Evacuations web app, the winner in the citizen/public facing category. It's designed to help users find the nearest evacuation shelters after a disaster and get directions there. The app also provides contact information for the shelters. "Technology and science have a role to play in making the planet a safer and more resilient place," said Margareta Wahlström, head of the UNISDR. "These apps will empower people across the world to manage the risks associated with extreme weather events fueled by climate change, which affect over 100 million people every year. Congratulations are in order to the winners and to Esri for taking this initiative." 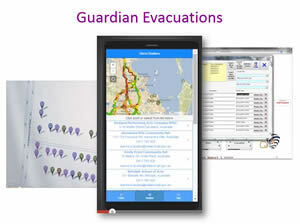 If a flood or other disaster occurs, people can use the Guardian Evacuations app to find the closest evacuation center. "Esri announced the app challenge in July and the response has been exceptional," said Esri president Jack Dangermond. "Participants built 22 apps that help cities and citizens build resilience to the impacts of disasters. The results are a very significant contribution to building the resilience of user communities, particularly those that are members of the Making Cities Resilient campaign. Esri will provide further assistance to ensure that these apps are widely available to the public." Alaska Permafrost Risk Application—This app helps communities analyze ground temperature in areas that have permafrost and determine how melt will impact infrastructure. Community Resilience Inference Measurement—This app quantifies the level of a community's resilience to climate-related hazards, based on 28 indicators. Users can see the factors that increase or decrease their resilience numbers. Loclfeed—When an area is in imminent danger, disaster teams can use this app to broadcast important information to local residents. They can download the app to see evacuation times, routes, route congestion, disaster shelters, and more. Modeling Resilience to Stormwater—This useful tool helps cities be ready for storms before they hit. Users can build scenarios to see how storm water runoff could pool around public and residential buildings and infrastructure. It also shows ways flood zones could be affected. Radar for Life—Following a disaster, citizens can access radar imagery and—from their ground-level vantage point—use the mobile app to verify damage and send information to the response center. Urban Seismic Induced Landslide Hazard Explorer—This app simulates rainfall and earthquake conditions that affect landslides and also evaluates the likelihood they will occur.